Security guards are responsible for keeping things in line in an often chaotic world. They also have a role in almost every level of society, which means that there are many job opportunities across the world for qualified candidates. Get your security guard cover letter in line with our free downloadable example & four career-specific writing tips and land your next job interview! If you’d like to save time, then let our cover letter builder do the work for you. My name is Leeroy Jenkins, and I found your job in the Las Vegas Sun this morning. 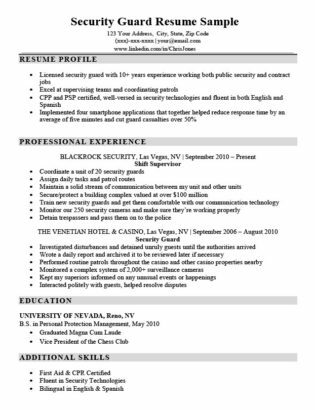 I’m a licensed security guard with over ten years of experience working in the Las Vegas area, where I’ve been employed as both a casino security officer and a construction site security supervisor. [Target Company] has been on my radar for many years – its reviews on glassdoor.com are great and I love the thought of working in Summerlin. During my time working in construction security, I functioned primarily in a supervisory role. This job granted me the chance to further develop my leadership skills and strengthen my understanding of security technologies. My superior officers saw my potential and boosted the number of guards working under me from 10 to 20 by my second year. I have a spotless history of ethical conduct, and my ability to lead a team as well as receive orders can be put to good use by [Target Company]. It’s come to my attention that [Target Company] has grown a lot recently and needs more security officers to look after new properties in Summerlin. Whether you need a supervisor or a patrol officer, I feel like I can fit into [Target Company]’s future and help keep its properties managed and safe. I would love the opportunity to interview with you and further discuss how I could immediately contribute towards securing the future of [Target Company]. You can contact me at [PHONE] or by email at [EMAIL]. I’m working nightshifts Wednesday through Sunday, but can make myself available anytime with advanced notice. Thank you for your consideration, I look forward to talking soon. A security guard is given substantial trust by their employer. Don’t prove you’re untrustworthy in your cover letter by revealing former company secrets or revealing the names of clients who wish to remain anonymous. Doing so will make most hiring managers reluctant to pursue your application further. 2. Highlight an area you excel in. If you are comfortable with security technologies such as surveillance systems or guard tour patrol systems, mention it. If you prefer operating as a supervisor, state how your leadership abilities make you an asset. Think about what you’re best at and be sure to include this somewhere. 3. Find out an area of need for your target company. It’s always helpful to know a bit about your future employer if possible – this will give you a leg up on much of the competition. If your target company is looking for people to work their nightshift position and you love working nightshifts, make sure you mention you thrive as a late-night security officer! It’s always helpful to know a bit about your future employer if possible – this will give you a leg up on much of the competition. 4. Mention a time you were commended for success. Describing a particular award or promotion is great, because it’s concrete evidence that you can handle the rigors of being a security guard. If you were recognized for your hard work, dedication or even heroism with employee of the month/quarter/year honors, fit it into your cover letter. If you’re still unsure how to put together an effective cover letter, our complete guide to writing a cover letter can walk you step-by-step through the process.